Do you want to watch the dance? Braiding Rivers Festival at Links Hall┃3111 North Western Avenue at Constellation, Chicago┃Friday, May 31, Saturday, June 1 and Sunday, June 2 at 7pm┃Tickets available online (recommended) or at the door, $10-$12. My husband and I come from a background of Eastern European folk dance and when there are no wooden clogs involved and the story being portrayed is not done as a glorified square dance about a harvest, we can be easily confused. However, when we attended the second weekend of the Braiding Rivers Festival, its theme “A Yogic Journey,” we were both riveted and refreshed at the idea that dance can be entertaining to watch, even without steins of beer in our hands. 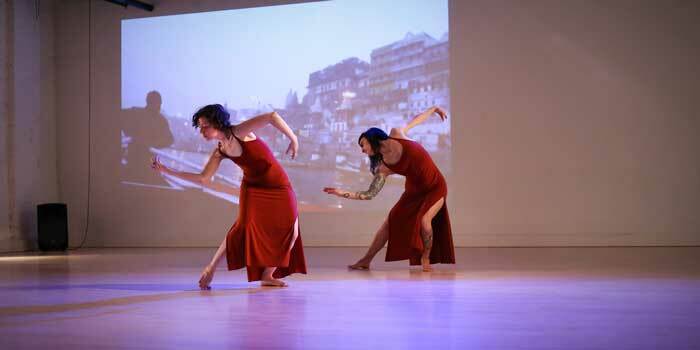 Over the course of three weekends, curator Emma Draves has brought together dancers influenced by Indian dance from across the country, at times housing them at her own apartment, to perform at the intimate Links Hall, newly relocated to the former Viaduct Theater at Western Avenue, just south of Belmont. Draves has been a student of bharatnatyam, a classical Indian dance form, and in her words, has been “engaging in intercultural dialogue with bharatanyam and contemporary dance.” It is this interest in the two art forms that culminated in her curation of the Braiding Rivers Festival. Draves is an artistic associate at Links, where the white box studio and lobby are still works in progress, smelling of fresh paint and plywood – the risers were finished on the opening day of the festival – with warm, gleaming wood floors in the white-walled studio and not-quite blackout curtains hanging more-or-less over the windows. The lobby area features a large, polished antique bar which will be quite the attraction once the venue obtains its liquor license, a moment that is clearly anticipated by the assortment of bar-height and low tables, as well as repurposed church pews, assembled for intermission or post-performance revelry. I can imagine that the larger studio, a black box theater, will offer a similarly renovated and welcoming space. Even with some of the sunset peaking through the gaps in the curtains, we forgot that Western Avenue existed just a brick wall and a few feet behind us at the jangling of bells and bangles that started the show. The University of Chicago group Aspara gave a more traditional performance of Indian dance which features dancers dancing individually but feeding off of one another to tell a story, a concept that is always refreshing and a novelty for people used to dances focused on the collective and not nearly such expressive movement above the waist. Posterchild, a multimedia collective based in Chicago, performed “Sacred Beginnings,” a piece influenced by recent experiences in India. Posterchild founder Nadine Lollino and artist Lydsae Rinio employed coordinated yogic movements as co-founder Bob Garrett played percussion to an electronic soundtrack that synced along with a video projected onto the white background of a man rowing a boat on the Ganges; the performance was a feast for the eyes and ears. The pièce de résistance, however, and I doubt anyone in the almost-at-capacity audience would disagree, was the acroyoga performed by dancer and choreographer Silvita Diaz Brown and Christopher Knowlton. I have never seen acroyoga before, had never even heard the term before attending Braiding Rivers, but after seeing Diaz Brown and Knowlton perform it, I implore you: go see some acroyoga! A chorus of four women dressed in white performed movements in the back right corner of the stage with Knowlton as Diaz Brown performed the beginning of the story, which was enthralling, but once the pair got rolling, I don’t think a fire alarm would have caused the audience to move from their seats unless flames were licking at our feet. Knowlton was tossing Diaz Brown in the air with his feet at times, but he made it look so effortless that it wasn’t until after the show that we saw most of his kabuki-looking stage makeup had melted into droplets on his face. I could spend paragraphs writing about each of the performances, but I’m not going to because the lineup is going to be different for the final weekend, including a performance by Draves herself, and I doubt it will be any less entertaining. Make room in your weekend to trust Emma Draves to lead into territory you may be unfamiliar with but will leave you craving to learn more.